As a student, answering quizzes or exams is one of the common class activities that happens regularly. Teachers provide exams to their students to gauge their understanding in a specific subject. It can also measure the knowledge of students and how the school performs in terms of teaching. This exercise is also important as the result of your exam will be included in computing your grades. Recently, a student who answers one of his lessons in a Filipino subject – the ‘awit’ “Florante and Laura,” caught the attention of the netizens. 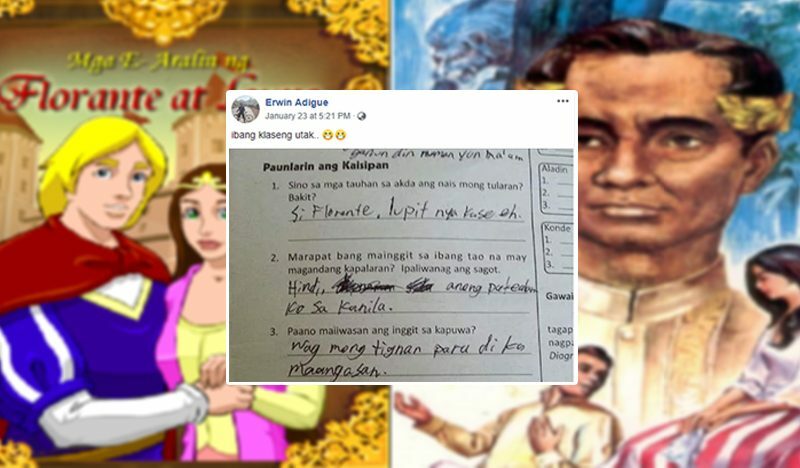 On January 23, a Facebook user named Erwin Adigue uploaded a photo of what seems to be a test booklet in the training titled “Paunlarin ang Kaisipan” in the book of “Florante and Laura”. The Facebook user didn’t reveal the name of the said student. Take a look at how the student answered the five questions in the test booklet. 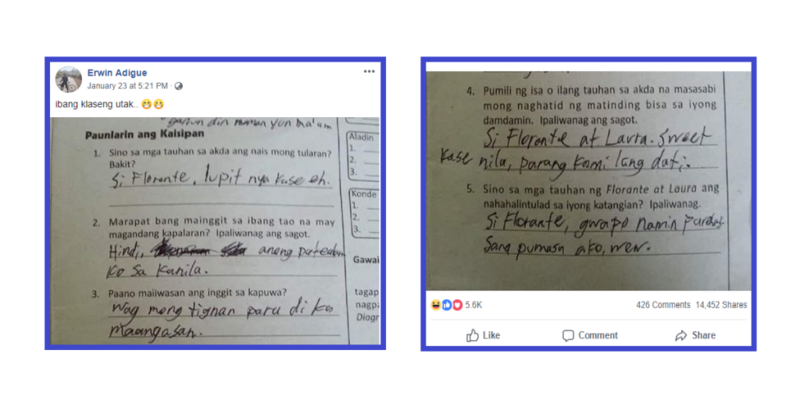 Meanwhile, netizens react differently to the way the student answered his exam. Some of them laughed and entertained, but there are also some who are concerned. 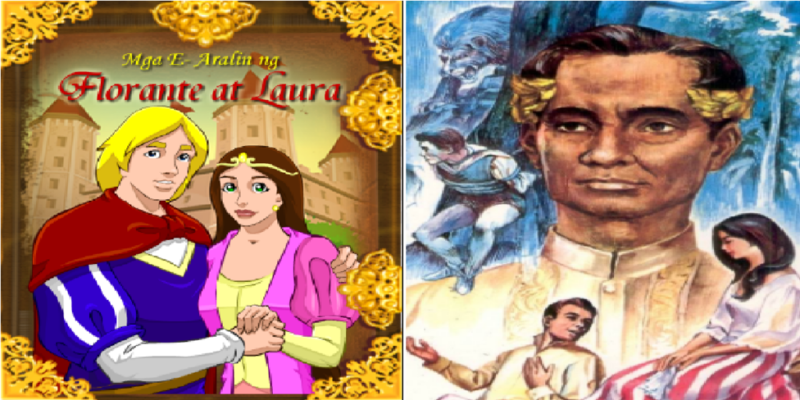 ‘Florante and Laura’ is a Filipino epic written by Francisco Balagtas aka Francisco Baltazar while he was in prison. 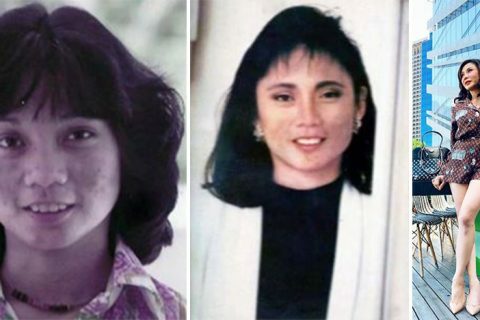 He was hailed as the greatest of Tagalog poets and his Florante at Laura was acclaimed as a masterpiece. This is introduced in the Eighth grade of the Filipino subject in Junior High School, accompanied by reading and teaching. The story is about the love and adventure of Florante and Laura, who are both Christians, and Aladin and Flerida are the same Moro. There are other works like this that came from some of the most respected Filipino workers, such as “Ibong Adarna” in the Seventh Grade, “Noli Me Tangere” in Ninth Grade, and “El Filibusterismo” in the Tenth Grade. “Awit” is a form of Filipino poetry, it’s a kind of narrative that deals with the real adventure and affair of kings and princes, princes and princesses, dukes and dukes, and other nobles in a kingdom.